Cockatoos are a group of parrot species that are large in size, very smart but also very noisy. Their intelligence, vitality, and beauty make them popular in the pet trade, however, because they are so noisy they are often abandoned as pet birds and so can be readily adopted from most pet bird shelters. Their price is fairly high compared to the other pet birds that are available. 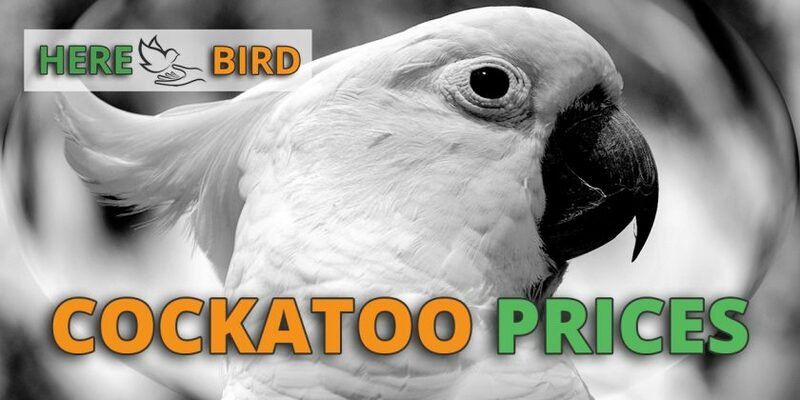 Understand that “cockatoo” is an umbrella term for a family of bird species that includes several different sub-species. So exactly how much does a cockatoo cost? On average you can expect to pay $2,000 for the most common species of cockatoo. But there is a large range between the types of cockatoos, with the most expensive subspecies costing up to $23,000 and the cheapest ones costing around $1,000. The price of this bird is shocking and will set you back $15,000 to $23,000. This is due to the unique look of the bird and its rarity. Only for people that have money to throw around! Also known as the Rose Breasted Cockatoo, this bird has a distinctive pink breasted plumage with grey wings. The price tag in America for a Galah cockatoo is $2000 to $3000. Those from Australia can find this bird available at lower rates because this is where the bird is native to. So intelligent, this bird species has been observed using tools in captivity. Also known as the Goffin’s Corella, you can expect to pay $1000 to $2000 to own one. A bird with a beautiful and very unique set of red, yellow and white head feathers. Because of their beauty and rarity, the Major Mitchell Cockatoo costs $5,000 to $6,500. These demanding birds have a white plumage with comes with a hint of a pink tinge. The cost of buying a Moluccan Cockatoo is $1000 to $2000. These large birds are very numerous within Australia but can only be bought in the USA from a breeder as importation of this bird is no longer allowed. The price of a sulphur crested cockatoo is $2000 to $4000. You’re likely to pay in excess of $3000 for these cockatoos that are a subspecies of the Sulphur Crested Cockatoo. The average Umbrella Cockatoo price is $2000. Also known as white cockatoos, their prices extend from $1000 at the lower end all the way up to $3000 depending upon the breeder. Note: Cockatiels are a subspecies of cockatoo which we have not included in this list because we’ve created an entirely separate pricing guide to these birds available here. 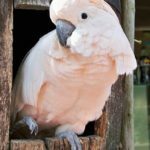 Cockatoo cage prices – This is the biggest initial cost for owning these bird (aside from buying the bird itself). The price for a cockatoo cage is likely to start at $200 but this is only for a cheap cage which will not last you long and is likely to be destroyed by a cockatoos powerful beak. Instead, it’s better to opt for a higher quality cage made from a reputable brand. These normally start at around $400 to $500 but larger versions and ones made to a higher standard can cost well over a thousand dollars. These prices are more expensive than standard bird cage because cockatoos themselves are so large. They also need cages that are very sturdy because cockatoos have such powerful beaks. For more details on buying a cage for cockatoos, read our full guide to the best bird cages here. Travel cages – A backup travel cage will be needed in addition to the main cage, you can expect to pay $150 to $250 for one that will be able to properly house a cockatoo. This is necessary in case there is ever an emergency and you need to remove the bird from the house or if the bird is sick and needs to be transported to the vet. Bird insurance and veterinary fees – The cost of taking your bird to a vet can be high without insurance. Luckily, a good bird insurance plan can cover the cost of many emergencies that might arise. However, you’ll still need to factor is the cost of yearly check ups for your cockatoo. Cockatoos toys – A necessity for keeping these birds mentally healthy. Foraging toys, playgrounds, chewable toys and puzzles will be needed to keep your birds’ minds busy. Expect to pay $40 to $80 setting up the environment within the cockatoo cage. Perches and stands – Perches and ladders will be needed within the cage so that your cockatoo can move around and a variety of different perches sizes helps to promote good foot health. A few good internal perches can cost you up to $60. A bird stand is a place where your cockatoo can rest and play when you’re keeping the bird outside of the cage. A good quality bird stand can cost you $100 to $200. Food costs – As cockatoos are a fairly large species of parrot they also require a fair amount of food. Fresh food and vegetables should be given to your birds in addition to bird pellets which can cost you from $20 to $40 per month. Cleaning supplies – Although a minor cost, you will still need bird cage liners and bird safe sanitizer for wiping and cleaning the cage regularly. Expect to pay $10 to $20 when topping up these supplies. The sub-species of cockatoo that you choose is the biggest factor in determining the price of these birds. However, age will also vary the price of the cockatoo. DNA testing can also increase or decrease the value of the bird. Purebred cockatoos that have not been mixed with other sub-species of cockatoo will be more valuable. The same increase in price will also occur if the cockatoo has been tested and is free from genetic diseases. The price will be lower if the cockatoos have mixed heritage and have any genetic diseases. Because Cockatoos are native to Australia and South-East Asia, expect the prices of these birds to be much lower in these areas, whereas in Europe and the USA the prices will be higher. When purchasing your cockatoo, consider how your bird is going to be transported from the breeder to its new home. Think about the cost of fuel for a long trip and you may require a transport cage (although some bird breeders will provide this so check the small print). 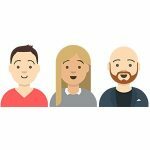 You can even ship some birds via airlines within your own country if you fulfill the correct requirements of the airline in question, a full guide is available here. Also, how the bird looks and whether or not it has any markings on its feathers or body will be a factor in the price of the birds. Blemishes and marks will drop the price whereas unusual and nice looking, unusual features will increase the price. Breeding pairs of cockatoos can be discounted and bought for a lower price than if you were to buy two cockatoo birds separately. 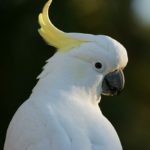 There is a major problem with cockatoos that first time buyers may not be aware of. It is simply the fact that these birds can be incredibly noisy. They have a lot of energy, require a lot of attention and when they don’t get it they are like a two year old child throwing a temper tantrum with very loud screams. Because of all this noise, many cockatoos are abandoned and given to bird shelters to look after. If you’re willing to take on an older bird, then you can adopt a cockatoo for free. However, you’ll need to ensure you can look after the bird in a well adjusted home. Also, be prepared for the heavy costs of looking after this bird, which includes lot’s of noise and also giving a lot of time and attention to this creature. If the price of your cockatoo is much lower than normal, be cautious. This could indicate a number of different problems with the bird. It could be that the cockatoo has behavior problems. This can include excessive biting, aggressiveness towards humans and other pet birds and being even noisier than the usual cockatoo (which is already noisy!). It could also mean that the bird has been illegally captured from the wild or that it is being traded illegally. Low prices could also mean the bird comes from a bird mill, so always google search the name of the breeder to see if you can find any reviews online of the person or company. On the other hand, if the price is excessively higher than normal then this could also indicate another type of scam. For example, be wary of any claims that the bird has any sort of genetic purity or special bloodline, if true this can be checked for and backed up with a DNA test. Because the birds have become endangered, it is illegal to internationally trade in several species on cockatoo. A good bird breeder will have a positive reputation and will be a member of a reputable bird breeding club or organization. Inspect the bird’s leg band number on the bird for further investigation of its origin. Be very wary of birds that do not have a bird band. Rules for owning cockatoos varies from country to country and even from state to state, so check your local laws. The most expensive time to buy a cockatoo is when it is a young adult and is no longer being weaned, essentially at the start of its sexual maturity. During this time the cockatoo is also strong and able to better adapt to a new environment and be transported somewhere new. Baby cockatoos are cheaper because they require a lot of care before they mature. Older cockatoos are also cheaper because they will become harder to train as they age. Cockatoos are high energy birds and because they are so smart they require a lot of attention. You’ll need to provide them with a lot of time outside of their cages every day and you’ll also need to interact with your cockatoo for several hours each day. Otherwise, these birds will start to misbehave and start screaming for attention. Providing toys and puzzles help to keep the birds’ minds entertained. You should also ensure that the cockatoo bonds with all of your household members so that the bird does not overbond with you and become aggressive towards other family members. You should also factor in the time you’ll need to spend training the bird, buying food supplies for the bird and the energy for cleaning any of its mess. Additionally, think about how much space the cage and your bird supplies are going to take up in the home. When a cockatoo is a good mood they can be adorable, fun loving, creative and very enjoyable. But poor training and very noisy screaming means that many cockatoos become abandoned, even when owners have spent a lot of money on these birds. It’s not just the money, but the time and attention required that most people won’t be able to provide for these birds. These are a species of bird that require perhaps the most attention of any pet parrot. So you need to be dedicated to them, it’s similar to the responsibility of looking after a baby toddler. Only if you’re prepared for this challenge should you consider getting a cockatoo.